Product prices and availability are accurate as of 2019-04-10 06:41:11 EDT and are subject to change. Any price and availability information displayed on http://www.amazon.com/ at the time of purchase will apply to the purchase of this product. 1" Monster Dry/Wet Diamond Granite/ concrete Core Drill Bits/ Hole Saws. 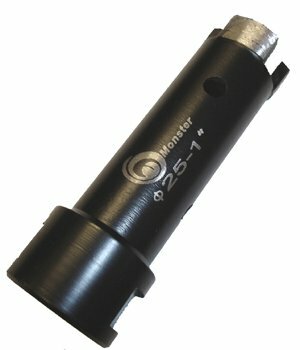 DRY Diamond Core Bits - Monster Brand are designed to meet the demands of more and more core drilling applications right on the job sites. These high quality diamond core bits can be used both dry and wet on granite and concrete countertops. They can be used to drill porcelain tile very effectively if edge chipping is not a big concern. Maximum speed for the bits are 4500 RPM. Use water to cool down the bit is highly recommend to extend their lives.